En.light.en.ment affirms the good of humanity, even while challenging many elements of human thought and life. 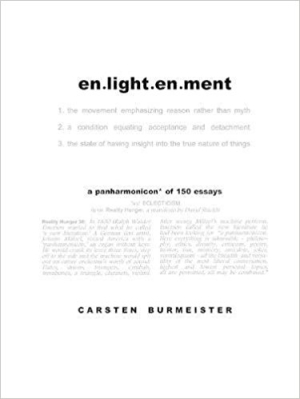 En.light.en.ment by Carsten Burmeister is a spiritual invitation to unconstrained free thinking. This volume of 150 brief essays, many of which are only a few hundred words, presents Burmeister’s “liberal life-stance” on a variety of topics, from philosophical themes like pacifism, meditation, Zen, and yoga to deep-thinking approaches to broader topics like creativity, money, and terrorism. Each essay is a novel bite of an in-depth topic, favoring fresh thought over comprehensive deconstruction. Essays are cross-referenced, making it easy to wander through the book, following whatever train of thought feels compelling. Burmeister aptly describes his style as “flippant succinctness over learned elaboration.” Creative diction and varied syntax show that he relishes language, in itself and as a medium, and he brings humor and keen insight to the problems and solutions of the human condition. While there is certainly some brash irreverence here, essays are more often an earnest plea to rethink and break free from the traps that so many fall into. The goal of the book is to present a challenge and urge determined exploration, but the result is far from elitist, off-putting, or aggressive. The book is full of quotes from thinkers ranging from Leonardo da Vinci to the Buddha. Quotes are used with finesse and creativity. Many terms are defined in and alongside the essays; they serve to slow the pace and deepen absorption of the presented ideas, giving each statement room to make its full impact. While the book is inherently about Burmeister’s thoughts and beliefs, his aim is not to force agreement so much as to encourage responsive thought; he seems to be begging his audience to stop accepting ideas without consideration. Pages are stark, with a luscious amount of white space, and the creative use of typefaces and layout echo the “rethink everything” ethos of the essays. Once the pattern of the essay layout is established, it’s refreshing and easy to follow. Disjointed front matter makes the book feel less coherent and cohesive than it ends up being. Back matter, though much more concise, feels like a slow, unfocused end.